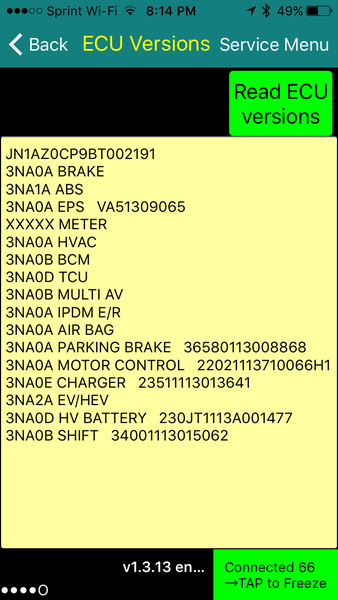 Here is an updated test version of LeafSpy Pro that adds any serial number information, if available, to an ECU listing. NocturnalWalt wrote: There is other stuff I've found too, but I haven't put any time into making sense of it yet (I probably wont for a while either as my playing has lead me off in another direction). For anyone interested in taking this further themselves, these three requests to the LBC (one at a time) will read the current battery data stored in the LBC. Turbo 3 - That test version of LeafSpy Pro is evolving very nicely. Consult doesn't have the ability to read the Meter part number either which confirms exactly what you've already found. 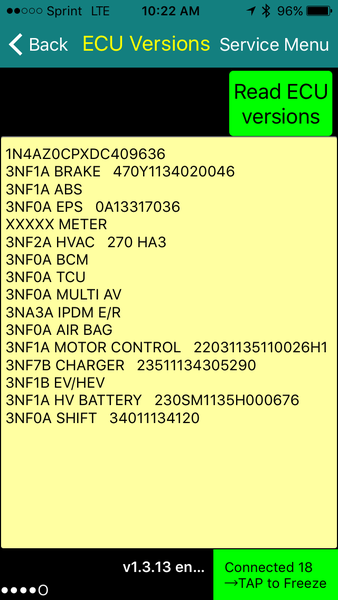 I hadn't tried firing that 84 serial number request at any of the other control modules, but that's interesting to know that things like the inverter and charger also report their serial number. caederus - My interest/goals mostly hinge around having a lot more flexibility to swap and or upgrade the HV battery than we have now. Thanks for your offer of help - I'm sure I'll be able to take you up on that at some point. It is handy that you have a UK built Leaf. My 2013 Leaf is a JDM model and Turbo3's is USDM so that gives us a good base for us to compare findings against. I worked out the request/response IDs for different control modules by observing Consult making requests to the control modules I am interested in. Your LBC Serial results look quite different to the ones I've found and Turbo3 posted. They may be right, but it also might be worth re-checking your method and results. JeremyW - Yeah I suspected the same thing. NocturnalWalt wrote: My interest/goals mostly hinge around having a lot more flexibility to swap and or upgrade the HV battery than we have now. That would be great, and I'm sure we can get further along that path, though I suspect reprogramming any intentional safety/security checks will be tricky. I worked out the request/response IDs for different control modules by observing Consult making requests to the control modules I am interested in. Do you have access to one? I wish I did - it would be so useful for checking many things. Your LBC Serial results look quite different to the ones I've found and Turbo3 posted. They may be right, but it also might be worth re-checking your method and results. You mean query 79b, group 84? If that is also what Turbo3 is calling HV BATTERY, it doesn't seem so different to me. Sorry caederus! You are absolutely correct about your LBC serial number looking completely normal. What I somehow missed in your data was that you were just showing us the other control modules that also return serial numbers with that 84 request. Turbo3 obviously picked up on that, but I clearly wasn't paying attention or I was running in zombie mode after a long day or something Full credit to you for finding those. Yes I have somewhat frequent access to Consult. And how is this progressing? Is there hope? Hi Valdemar. Yes there is certainly hope but my progress is slow. I think we will get there, but when is anyone's guess. Reading serial ... thats fine. Consult does that, but what is the practical application of knowing the serial? LeafSpy provides information like any good spy. It is up to the user(s) to decide how to use it. But knowing the battery serial number might tell you something about when/how the battery was manufactured if enough people report their data. Parts of the serial number might change based on chemistry or other interesting factors. I would guess the "Battery Programming Card" generates a special code number required to marry the VCM and BMS ECU using the battery's serial number. A CAN trace of the process would tell us more about what is going on. I would thing the PCMCIA card includes an encryption chip so it is not going to be easy to bypass it. I don't recall seeing that card for sale so probably only dealers can get it.